The first time I had heard of Beard Papa was during my first trip to Tokyo early last year. There was a sweet pastry smell in the winter air, and then we spotted a line in front of a trailer-like store, with the line full of kids in their school uniforms. WIth the smell drawing us near, we decided to wait in the line and try the cream puffs from the bright yellow trailer. 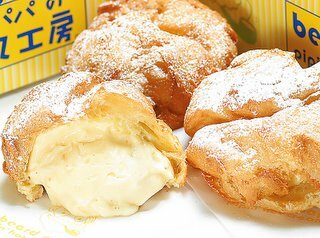 It was worth it- warm and fresh- the cream puff had an airy combination of the crispness of the skin and the softness of the inside of the puff, along with the melt in your mouth vanilla bean creme which tasted more custard than a frosting whip cream. The Beard Papa experience in Taipei is a bit different. Though they have the same logo smiling at you, the countertops of cream puffs have already been baked and have been cooled off- piled waiting to be filled with your choice of the original vanilla bean creme, or sometimes daily special such as chocolate or coffee. They are located in the mall food courts instead of outside. 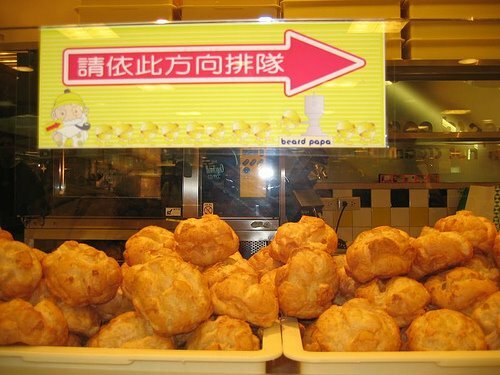 There is no fresh baked hot puff smell wafting towards you or hot puff for you to bite into. There is no line. 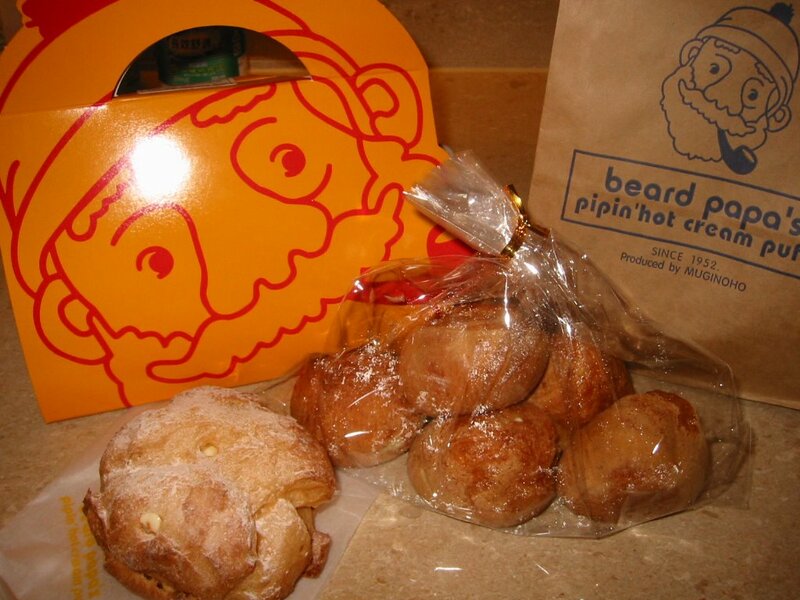 Not to say that the Beard Papa puff isn't worth eating here, it's still good. Just not melt in your mouth delicious. As anyone who has experienced both a "hot" freshly made Krispy Kreme donut and one that was not, you know what I'm talking about. As cream puffs go, it's still a good treat. At NT$40 a puff, it's not cheap and it's not expensive. The original vanilla flavor is my favorite, you can see the vanilla bean specks in the creme. Not being a fan of chocolate ice cream or milkshakes, I prefer the vanilla over the chocolate. The coffee flavor tastes like chocolate with a smidge of coffee flavor. I really like how the cream is a custard and sweet, but not too sweet, rather than like whipped cream that you might find in tiramisu or a donut which often tastes too much like frosting for me. They also are launching a new mochi cream puff. They are smaller and chewier, as the puffs are made with a gluten flour. Being smaller, you get less of the cream, which is a minus. They taste similar to the ring donuts from Mr. Donut, which is an interesting blend of chewiness and doughiness. I prefer the original cream puffs to the mochi ones, which run for the same price. If sounds good to you, they are in lots of locations in Taipei, but I only know of these two off the top of my head, and now all over the world. There are locations opening all across California besides their locations in Gardena and Hollywood, and have locations in NY, NJ, Boston, Honolulu and have a store set to open in San Francisco. It was a promising idea- catching the last day of afternoon tea during a featured month of special strawberry themed desserts. Mmmm, strawberry desserts. But there were a few problems in our afternoon- (1) we got there at 5:20 or so, which left 40 minutes of time to wander and consume the items from the buffet area and (2) the strawberry desserts I had imagined were much yummier than the ones that were actually there. The setting could actually be quite romantic or fun with a small group of friends- an open lounge on the 2nd floor of the hotel, dimly lit, with cushy couch area seating. The service is not bad- they whisk away the unwanted plates and offer the typical hotel type of emotion. The price is NT$600 plus service fee, which at US$18 is a bit pricier than I like to pay for an afternoon snack, even if it's a buffet. But we made the special trip and decided to try it out. There were three main tables aligned in a U shape. 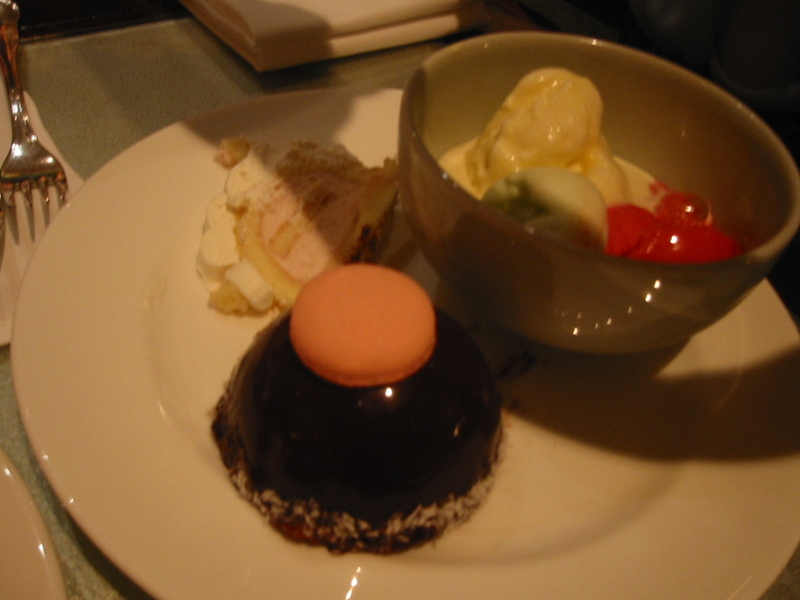 The first one had all the desserts- cakes, cheesecakes, chocolate mousses, ice cream, even sauteed strawberries. The second table had finger sandwiches with different breads and fillings, fruit and salad bowls. There were some areas with bowls that were empty and not refilled, like one which I think used to have guacamole in it. The third table had a row of heated steamers, featuring an assortment of dim sum including gyoza and sau mai. Because the servers repeated warned us that we only had until six o'clock for the food, I loaded up anything that looked interesting onto the plates to take back to our tables. True to their word, at six, they quickly cleared the buffet area, allowing you to lounge in the area, but if you hadn't responded to their last call, you were out of luck. At about 630, they started placing the items for their dinnertime buffet, which I will say that they recommended/offered us to wait to eat. Timing wise, it didn't work out for us. So I would recommend, if you do want to try Cha Lounge, you go early to give yourself time to lounge and enjoy browsing and tasting everything, instead of feeling so rushed as we did. I started with the desserts, but out of all their assortment of beautiful looking slices of cakes and sweets, the best tasting was strawberry topped square cheesecake. It was creamy and sweet with the familiar texture of a good cheesecake. The two chocolate cakes were pretty good, but very rich. One was a dense chocolate cake and the other was a beautiful dome of glazed chocolate covering the mousse inside. The other cakes were lackluster- with too much frosting, or tiny slices of strawberries adorning them. Even at the serving table, they looked a bit as if they had been sitting out too long, the mousse cakes falling over a bit. What happened to the promising strawberry theme? There were some mousse and tarts, but looked like any dessert buffet staple. Even the freshly sauteed strawberries disappointed- even after the chef worked his pan magic- the strawberries were unattractive plate of soggy strawberries that didn't taste sweet or have the luscious strawberry flavor. They tasted like watered down cooked berries. There were three smalled tins of ice cream over ice, vanilla, mango and strawberry? The flavors were good, but they were melting in the serving area and quickly became of an unfortunate pool of melted ice cream in my bowl. Maybe I expected too much? Like bowls of fresh sweet strawberries and a chocolate fountain? I wondered why I expected that and realized it was because of a picture that was featured in the ad I had seen and perhaps that was only for Valentine's day? I don't know. 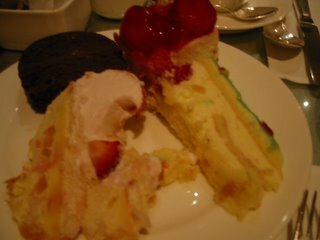 Nevertheless, the dessert table was just okay. Gliding over the sandwiches table, none of them looked quite appetizing. I would have liked maybe a simple club or tuna sandwich to munch on, but they were all a bit more adventurous, on rolls and with interesting combinations of fillings. The bowls of fruit looked picked over- again a result of us coming so late to the buffet, but it's too bad that they did not refill the bowls that had been emptied. The dim sum table ended up being the most tasty. The gyoza were pan fried and tasty, and I ended up eating a near plateful of them in attempt to get my money's worth. They were also a good balance to all the sugar I was sampling. I suppose I will have to try more different afternoon teas to be a better judge of how this one compares, but in general, I would probably not come back to Cha Lounge, I'd probably make my date at JOYCE CAFE. For a better value, you could either get an assortment of tastier desserts elsewhere; for sandwiches, you could wander over to CHEERS which is also in the Grand Hyatt; for a buffet, you could fill up with three times the amount of food selections for the same price at the new SPICE MARKET in Eslite. 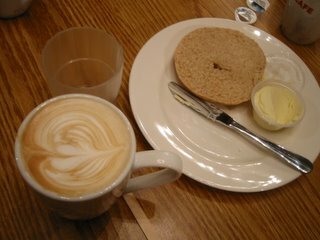 I had heard about NY Bagel Cafe's American style breakfasts for awhile when they only had their Ren Ai location- after all, pancakes, french toast, eggs and bagels are quite a contrast to the standard breakfast here which is usually porridge with sides of dried pork, pickled cucumbers, spicy bamboo, salty egg and sweet gluten; or hot soy milk with yo-tyow (long deep fried bubble sticks) to dip in. And I LOVE breakfast. Last year when I was with my cousin, we taxied to over 4 different places in search of the perfect waffle breakfast in Taipei. I love to make waffles and omelettes at home and it's tough finding other places that can serve it as satisfying to my tastebuds as when I make it myself. When the new NY Bagel Cafe XinYi location opened last fall nearby, I finally got a chance to see what all the fuss was about. They have a good range of bagels (NT$50) to choose from, including plain, wheat, blueberry, cinnamon raisin and onion, as well as various flavors of cream cheese, which come for an additional NT$20-40. They are all pretty good, with the right amount of chewy denseness, but fresh rather than hard. I prefer to get mine to go and toast them at home. Offering various set menu breakfasts, which you choose from french toast or pancakes with corned beef hash and eggs as your main dish and you get a drink/coffee, side of apples, small glass of OJ for . Go for the french toast- it's not the best I've ever had, but it's eggy and sweet enough to satisfy. The banana chocolate walnut pancakes sounded so promising, but they were so dry as if they chef forgot to add enough milk to the mix- the opposite of fluffy or melt in your mouth. A huge disappointment. 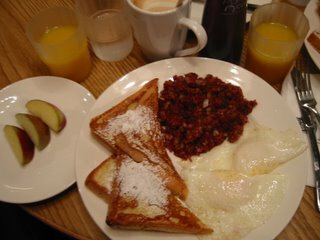 The eggs were slightly greasy, but the corned beef hash was even more greasy and artificial tasting. The side of apple slices are a little strange, but refreshing. The small glass of OJ is tiny and the latte looks pretty but has the burnt bitter coffee taste- but then again, I am not a regular coffee drinker. My coffee drink of choice is typically a vanilla latte or ice blended from Coffee Bean or Starbucks and compare all my coffee experiences to that. They have various sandwiches and pastas, but I've found their steak sandwich (NT$240) to be surprisingly good. 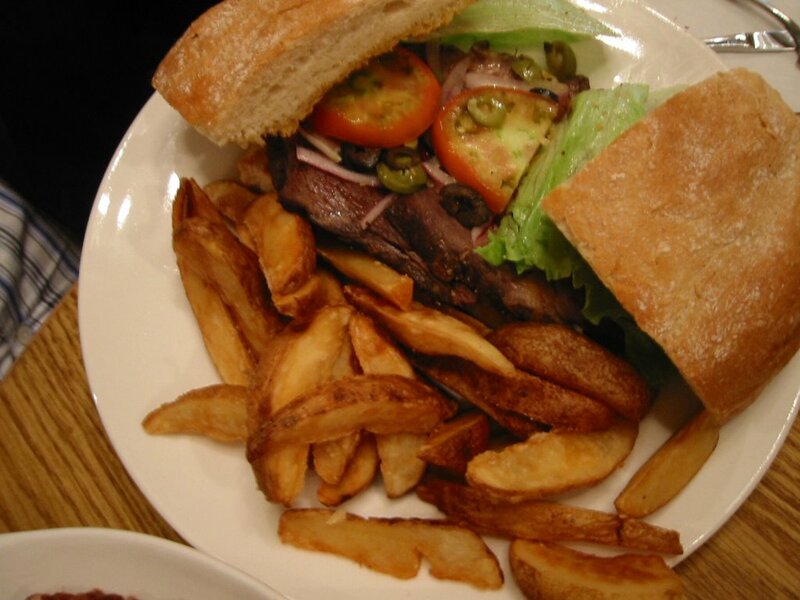 It comes with toasted ciabatta bread and fat steak fries, which makes for a filling and satisfying meal. The fries taste baked rather than fried. The texture of the bread fits perfectly with the steak, and the sandwich is almost too tall to take a bite. I've also tried their roast beef sandwich which is a disappointing couple slices of roast beef on a roll. I've heard the roast beef sandwich is better at the Ren Ai location. They do have a tasty selection of Junior's cheesecakes- brownie, key lime and original. I tried the key lime which had a slight lime flavor and was not too sweet. The slices are small for the price NT$145, but the right portion if you don't want to eat too much for a late night snack. The menu has chinese and english and pictures of some of the items, such as the breakfasts. The area is casual with lots of booths and high ceilings, as well as outdoor tables to sit when the weather is good. With loud music playing, it's definitely a diner atmosphere. It's a very popular late night hang out and often there is a waiting time at night. All the times I've been there, I've found the service to be unbearably slow and unsatisfactory. The order slowly comes to the table, one dish or drink at a time, even when the restaurant was not particularly crowded. We also had to frequently wave down the servers to get assistance and in general, I've found that they are not particularly friendly or helpful. Hopefully, if you are there with a large group, you can use the conversation to make the time pass by. You can also order to-go and just enjoy it somewhere else.